Sometimes, the timing of a slide is too long. So, you want to divide it into parts to have a better view and easily manage your contents. In this case, using the Split Slide feature is a good choice as you can break a slide into two or more slides. This command also comes in handy when you wish to create transition effects between slides. Otherwises, if you need to combine multiple slides, you’re given the Merge Slides command. Today we’ll walk you through all information about these two options. Step 2: Navigate to the Timeline pane. Then, place the Playhead at the timestamp you wish to split. 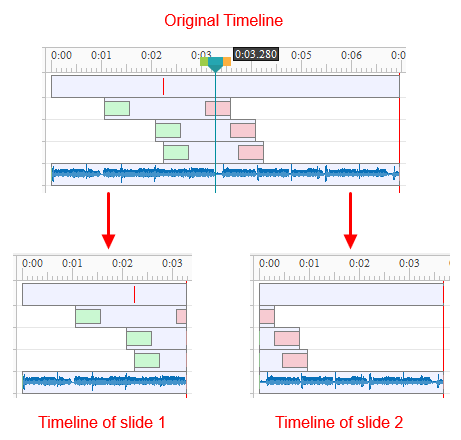 By doing so, the Split Slide command in the toolbar of the Timeline pane becomes available. Step 3: Click Split Slide. Then, the app automatically splits your slide into two slides. The left side of the Playhead remains its position in the original slide. Meanwhile, all objects and effects in the right side are moved to the new slide right after the original one. After that, you can treat the new slide as an independent one. In other words, just work with this slide as normally you do. If the Playhead lies in the middle of an object Time Bar, the Time Bar will be split at the Playhead position, and its right part is transferred to the new slide. The app will split any object at the position where the Playhead is placed no matter what you choose their object Time Bars or not. Use this feature to split a slide as many time as you want. In case you need to combine several slides into one slide, just use the Merge Slides command. Do that in a couple of seconds. Step 1: Select two or more slides. If you want to merge all slides in the current project, right-click a slide and click Select All from the context menu. Step 2: Right-click selected slides > Merge Slides. After that, ActivePresenter merges selected slides into the first selected slide. That’s it! You’ve known all simple steps to split and merge slides in ActivePresenter 7. Use them from now on, and don’t forget to contact us if you need further help.